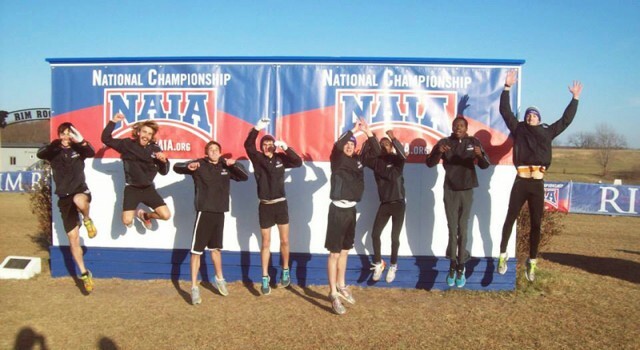 The men’s cross country team ends their season after appearing at the NAIA National Championship. The Goshen College men’s cross country team ended its season on a historic note, making their first ever team appearance at the NAIA National Championship in Kansas on Saturday, Nov. 22. The Maple Leafs ran at Rim Rock Farm in Kansas. Over 300 runners participated in the National Championship, where the Maple Leafs finished 27th overall with a total of 713 points. The first two GC runners to finish the race were seniors: Jordan Smeltzer, from New Paris, Ind., and Moses Kaelo, from Narok, Kenya. They ended up with a time of 26:41:70, and it was determined that Kaelo was the first to finish after using video review. The next ones to finish were Danny Klink, a sophomore who finished with a time of 27:30.20; Luke Kauffman, a sophomore with a time of 27:31.40; and Lucas Harnish, a junior who ran in at 27:36.50. After this trio of runners, Tim Lehman, a junior, crossed the line at 27:52.20 followed by sophomore Isaiah Friesen, with a time of 28:55. Kaelo also gave his opinion about the race. Their next goal is to compete with the track and field team in the spring season. Many of the cross country team members will join the track and field for the spring season, which will start on Jan. 23 with its first meet in Findlay, Ohio.